Earlier this Summer, my friend Amy Green (Simply Sugar & Gluten-Free) posted a recipe for Ginger Ale. Firstly, I love ginger. Fresh ginger. So much so that when our friend and fellow Aikidoka opened up Yang-Kee Noodle and invited Chaz and I to a taste test before the opening, I gushed over the Ginger Chicken we tasted. It was so full of ginger that it was spicy hot. Apparently too spicy hot for a lot of people living in Louisville. Secondly, I concoct home remedies from fresh ginger when I’m really sick. Ginger tea. Ginger soup. Voo Doo Soup (created my one of my ex-roommates and is full of ginger). Thirdly, ginger is so good for you that it’s a shame when Big Food mucks it up with sugar and all kinds of other crap so Amy’s Ginger Ale makes all other ginger ales pale in comparison. I told her that it was so easy that I can’t believe I never thought of it it since it’s similar to what I do for myself when I’m sick. Seriously. Easy peasy. If you love ginger ale and haven’t tried her recipe. Go. Now. Well, after you’re done reading this post that is. So why am I going on and on about Amy’s Ginger Ale when the title of this post is Healthier Grape Soda? Because I’ve been craving grape soda and doing my best to stay away from those sugar filled bottles and cans of soda. I had been making Amy’s Ginger Ale for several weeks when it hit me. I can make my own grape soda. Hallelujah! I use black grapes a lot because their darker coloring means more of the good polyphenols and antioxidants. Black grapes also taste sweeter than red and green grapes to me. Juice your grapes in a juicer. If you don’t have a juicer but have a high quality blender you can make a whole foods juice. 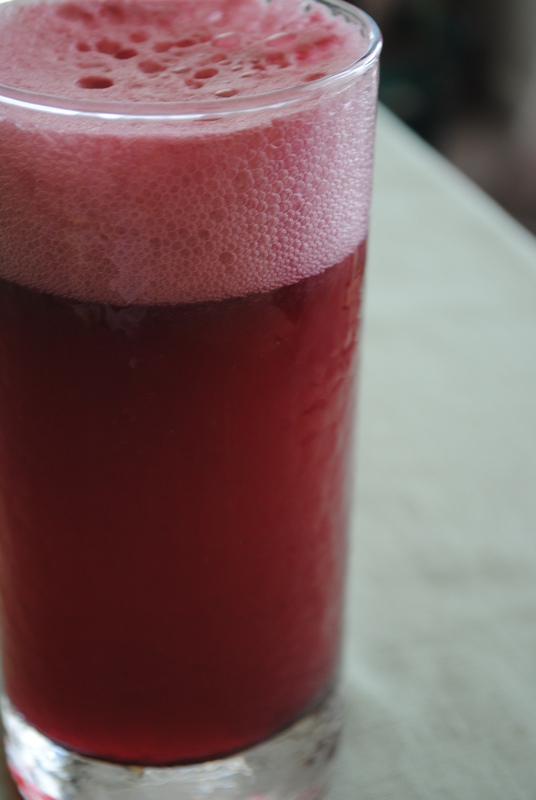 Pour the grape juice in a glass and fill the rest of the glass with sparkling mineral water. This won’t be sweet like sodas you’re used to so you can juice more grapes if you’d like for added sweetness or add a little natural sweetener. This post is linked to 5-Ingredient Mondays at The Daily Dietribe. This entry was tagged black grapes, gluten-free, Grape Soda, healthy, sparkling mineral water, whole foods diet. Bookmark the permalink. I love doing this with grapefruit juice. Fresh grapefruit juice, cold sparkling water, and a bit of Stevia. Yum. Never thought about doing it with grapes… I’ll have to try it! Grapefruit sounds so yummy, too!